Railroads New York Central System Lakeshore Michig[an Southern], c1910. WRHS. Railroads New York Central System Lakeshore Michig[an Southern], c1900s. WRHS. 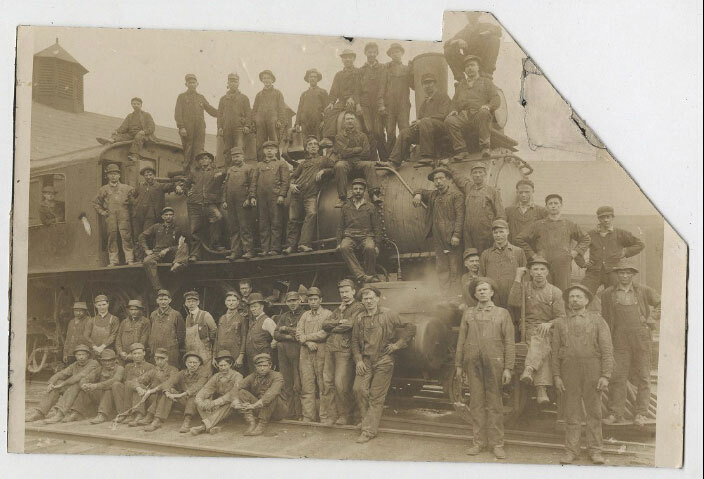 In the years around 1900, railroad managers and photographers often posed work crews on locomotives for postcards and publicity shots. Labor unions also arranged photos of this kind. Bylaws stipulated that only men ‘white born, of good moral character, sober and industrious, sound in body and limb’ could join [the railroad unions]. The genre conveyed the enormity of the railroad enterprise, the sheer bulk of locomotives relative to individual men. But the pictures also emphasized the pride of workers in their shared building, operating, and maintenance of the system that kept commerce flowing. Both of the shots above were taken at Lake Shore and Michigan Southern facilities in the Cleveland area, very likely at the Collinwood yards. In the photographs, strong men literally lean on one another, mutually dependent soldiers in an industrial army. 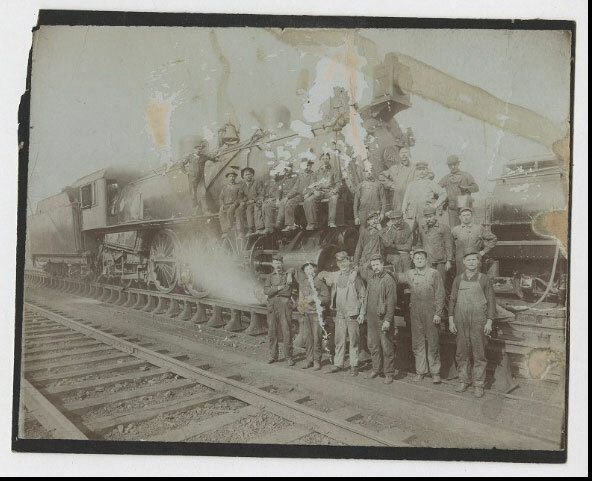 Theodore Roosevelt saw railroad workers very much as these photographs did. Speaking to a gathering of railroad engineers in 1903, he observed a “tendency toward the softening of the national fiber. . . . [a] disuse of the rugged virtues which lie at the bed of manhood and fill professions like yours.” Railroad trainmen, said Roosevelt, “exercise Brotherhood of Locomotive Engineer’s Monthly Journal, Jan 1900, p.21. the old, old qualities of courage and daring resolution and unflinching willingness to meet danger.” At a time of mass immigration and economic change, railroad workers stood for longstanding, American, manly traditions. Not surprisingly, this model of manhood often led railroad unions to anti-immigrant invective, to denouncing “foreign” labor as a threat to real “American” wages and jobs. Black, Asian, and Southern and Eastern European immigrant laborers were forbidden membership in the Brotherhood of Railroad Trainmen and other railroad unions, bastions of nativist sentiment. Bylaws stipulated that only men “white born, of good moral character, sober and industrious, sound in body and limb” could join. Others performed primarily the lowest-paid, unskilled labor for railroads, digging ditches and laying track, for example. The poster below, originally printed around 1900, shows how fully the Brotherhood promoted this ideal of the reliable, white, and manly railroad worker. Read in proper sequence, the smaller pictures within the larger image narrate the life and death of a trainman and the Brotherhood’s role in watching over him and his family. The story begins with the bottom right image and moves counter-clockwise through the others. In the first of these Brotherhood of Railroad Trainmen, Originally printed, c.1900. View pictures counterclockwise beginning at lower right. Photo from cigarboxlabels.com. pictures, a trainman headed to work leaves his wife and children at their humble but respectable home. He then appears proudly, even magisterially, riding the top of boxcars in performance of his duties. The train plummets from a bridge. Officers of the Brotherhood get the news and visit the trainman’s widow and children. After a funeral, they deliver an insurance check, providing support for the family. The Brotherhood meets, holding its own all-male memorial for their fallen comrade. An allegorical angel of benevolence, sobriety, and industry hovers over this tale of loss and fraternal protection. 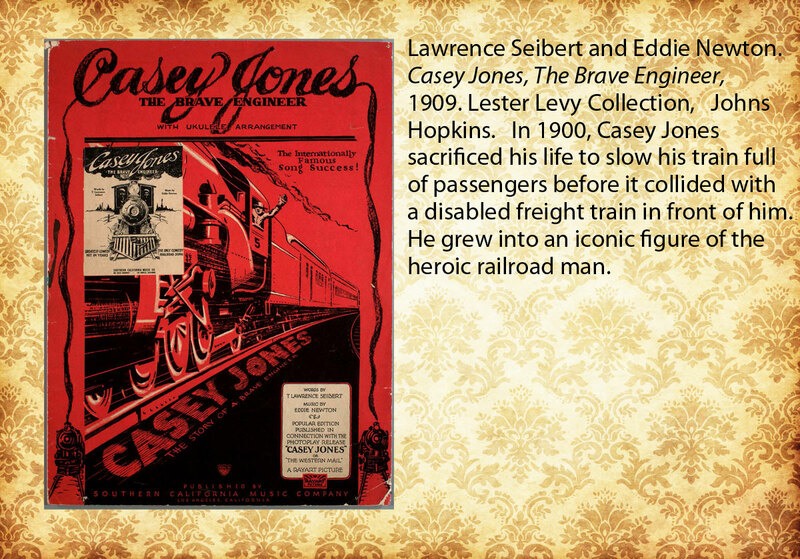 Composers even wrote popular songs about the bravery and devotion to family of railroad men and the perils they faced at work. Nothing, we are led to believe, was more important to the trainman than self-sacrifice, self-discipline, and protecting his family. Trainmen in the Collinwood yard lived every day with immense bodily risk but surely believed that their children–or the children of fellow workers, if they had none of their own–faced none of industrialization’s brutality while sheltered at the local school. Many likely saw education as a catalyst for upward mobility, perhaps a path for their children to less dangerous work. How painful and self-annihilating it must have been to learn instead that the town’s elementary school held hazards unmatched by the steam, smoke, and steel of the trainyards. The railyard posed only the most obvious perils of reckless growth and industrialization in Collinwood. Devastated adults, including trainmen, survived the day of the fire, but almost half of the school’s children didn’t. 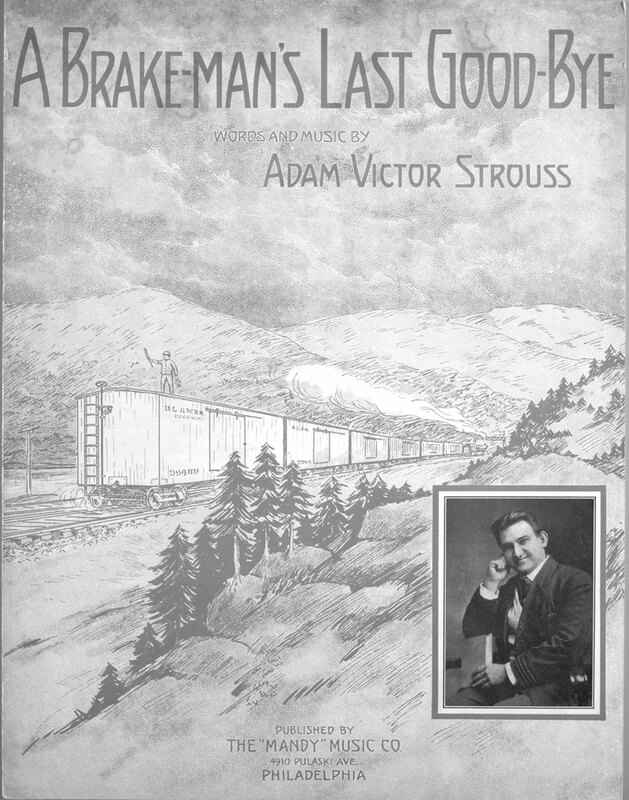 Adam Victor Strouss, A Brake-Man’s Last Good-Bye, 1914. Levy Sheet Music, Johns Hopkins. 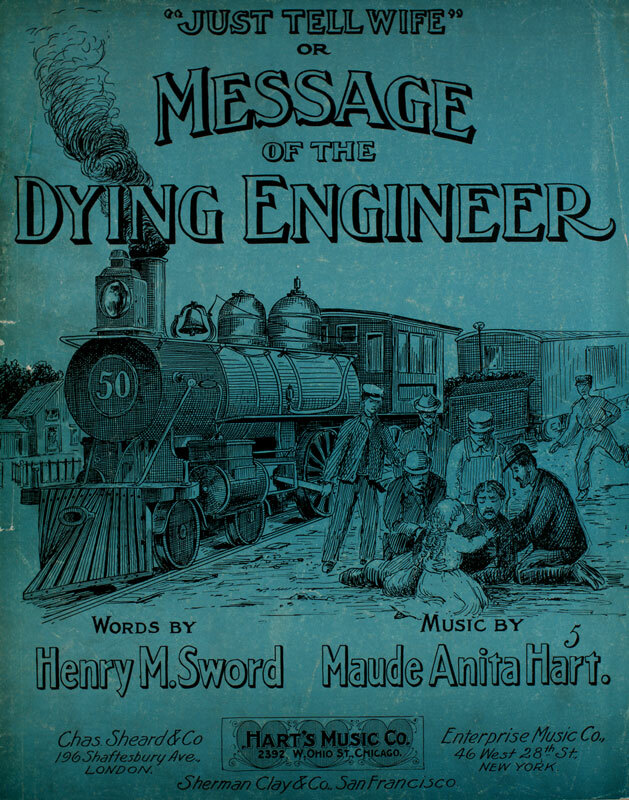 In this song, a brakeman on his way to work says goodbye to his wife and child. That night, during a mountain descent, he dies in a runaway train crash.